String theory, which came onto the physics scene in 1984, is a theory that postulates that the Universe consists of tiny strings vibrating in ten or so dimensions (as opposed to the three spatial dimensions plus one time dimension that humans can see). But the theory has its share of problems. For one thing, recent calculations suggest that it generates 10^500 possible models of the Universe. According to critics, this renders the theory essentially meaningless. Another difficulty is that if strings exist, they would be detectable only at energies far above anything that today’s experiments can measure. The biggest hole string theory has failed to fill is the elusive link between gravity and quantum mechanics. In addition, many university research programs dedicate themselves to string theory research, forsaking other areas. Some physicists warn that the theory’s dominance could pose a threat to the scientific method itself. Moreover, many graduate students are compelled to drink the string theory Kool-Aid and follow suit if they want to progress in their graduate programs. But more physicists these days are starting to question the wisdom of placing all the physics eggs in one basket. Two popular books lay out this contrarian rationale: The Trouble with Physics by Lee Smolin (a physicist at the Perimeter Institute for Theoretical Physics in Waterloo, Canada), and Not Even Wrong by Peter Woit (a mathematician at Columbia University in New York City). Smolin’s book promotes an alternative theory known as loop quantum gravity. The "Not Even Wrong" title is a phrase that physicist Wolfgang Pauli used to describe incomplete ideas. Both authors maintain that the theoretical community devoted to string theory will end up isolated with the rest of physics and point out that string theory groups rarely hire researchers working in any of the other approaches to quantum gravity. As the two factions begin to draw a line in the sand, the string theorists aren’t taking the criticism lying down. For instance, Joe Polchinski, a string theorist at the Kavli Institute for Theoretical Physics in Santa Barbara, California claims that string theory has contributed to other areas of physics such as heavy-ion physics. Other theorists such as Warren Perkins of Swansea University in Wales point out that string theory provides far simpler approximations than its field-theory counterpart, and may be used to predict how particles behave at the LHC. As a Physics Groupie, I love to see a heated science controversy. I think the result will be a more focused theory regardless of which side wins. 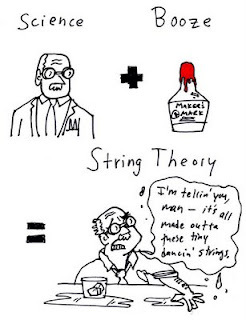 The string theory debate is one that I intend to follow closely in the years to come.